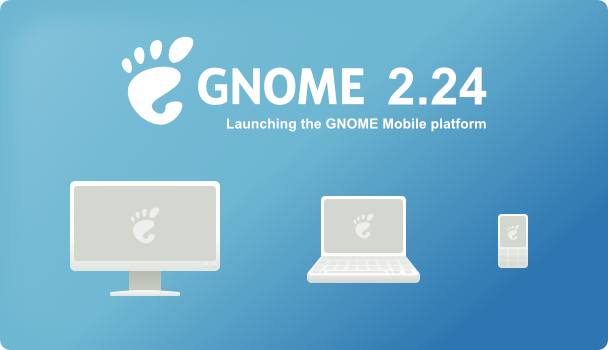 After six months of work from the whole community, we can finally introduce GNOME 2.24.0 to the world! It's a good release, with cool new stuff and big improvements (as usual ;-)). Among other things, I'm happy that empathy got in, and also glad for the ekiga team to see that they managed to get ekiga 3.0 out in time! It's actually a bit unfair to just mention those two events, since many more people rocked; go check the release notes to learn about more changes. Oh, and the 1000th commit to the releng modules was the one finalizing this release. Magic number! Okay, I'm lying here: because of two last-minutes tarballs, the real official 2.24.0 commit was the 1001st. It still looks good, doesn't it? Noteworthy: GNOME 2.24.0 is out!